Cook fettuccini in large saucepan as directed on package. Drain; cover to keep warm. Meanwhile, chop reserved fennel leaves to measure 2 tablespoons; set aside. Heat oil in 12-inch nonstick skillet over medium-high heat until hot. Add fennel; cook and stir 3 to 4 minutes or until crisp-tender. 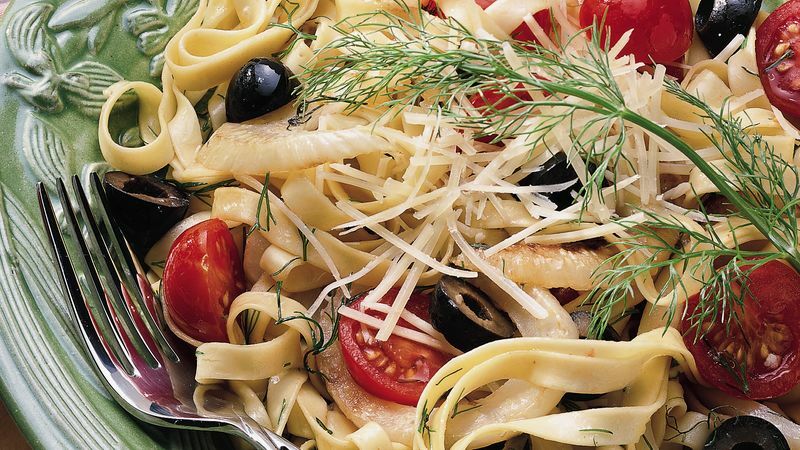 Add chopped fennel leaves, tomatoes, olives, salt and pepper; cook 1 to 2 minutes or until thoroughly heated. Add cooked fettuccini; toss gently to mix. Sprinkle with cheese. If desired, garnish with additional fennel leaves. A variety of colorful and sweet small tomatoes are perfect for this pasta. In addition to cherry tomatoes, look for tiny grape tomatoes and small yellow pear tomatoes. Six ounces of dry fettuccine can be used in place of the refrigerated fettuccine. Cook the dry pasta as directed on the package. Two medium tomatoes, coarsely chopped, can be used in place of the cherry tomatoes. Serve this vegetable-rich fettuccine with crusty Italian bread and with romaine tossed with a little red wine vinaigrette.